Workman Publishing Company, 9780761168003, 368pp. 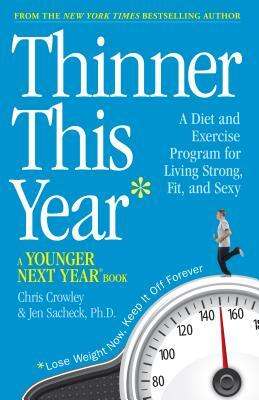 Chris Crowley, the memorable patient and coauthor of Younger Next Year, partners with Jen Sacheck, a nutritionist and exercise physiologist from Tufts University, and in lively, alternating chapters they spell out a weight-loss plan that will have readers lose up to 25 pounds in the first six months—and keep it off for life. The message is straightforward and based on the most up-to-date nutritional science: Avoid “dead,” i.e., nutrient-poor, foods, particularly the SOFAS (solid fats, added sugars) choices that comprise more than a third of our diet. Design your plate to be 50% vegetables and fruits, 25% whole grains, and 25% lean proteins. Skip the supplements. Never drink your calories. And exercise. Exercise, the authors emphasize, is the great flywheel of weight loss. And whereas Younger Next Year told you why to exercise six days a week—Thinner This Year tells you how to eat and how to exercise, from the best aerobic workouts to a lifetime supply of 25 whole-body strength exercises—the “Sacred 25”—that will build muscle, protect joints, and add mobility. Exercise will do more than anything else to put off 70% of “normal” aging until the very end and eliminate 50% of serious illness and injury. Chris Crowley, a former litigator (Davis Polk & Wardwell), is the coauthor, with Henry S. Lodge, of the Younger Next Year books, and the coauthor, with Jen Sacheck, PhD, of Thinner This Year. Though in his eighties, he fully lives the life, skiing black diamonds and routinely doing fifty-mile bike rides. He and his wife live in New York City. and Policy at Tufts University. Dr. Sacheck lives in Concord, Massachusetts. “A great combo of diet and exercise, with an easy to understand format. Clear, concise, well-balanced nutritious diet plan. Realistic exercise. The combo of the authors—nutrition scientist and witty writer—makes this an easy to read volume with loads of timely, science based information. Helps each reader create their own story for weight loss. “Chock-full of easy recipes, meal plans, and exercise diagrams."